Washington and Lee University’s 7th Annual Entrepreneurship Summit will take place Friday and Saturday, September 21-22, 2018. Alumni registration is now open online via Colonnade Connections. Chip Mahan ’73, CEO of Live Oak Bank, and Amy Bohutinsky ’97, COO of Zillow Group, will keynote the event. Mahan is the founder, CEO, and chairman of the board of directors of Live Oak Bank. He is a founding member of nCino and serves on nCino’s board of directors. 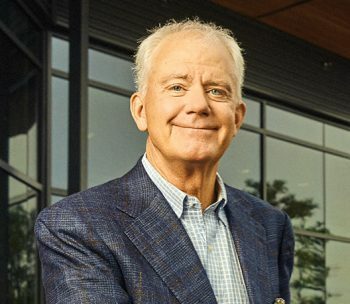 Prior to Live Oak Bank, he was the CEO and chairman of the board for S1 Corporation and founder of Security First Network Bank, the world’s first Internet bank. Chip was ranked as one of the “10 Most Influential Personalities” in Financial Services by FutureBanker magazine. Bohutinsky is COO of Zillow Group, a portfolio of the world’s largest real estate and home-related brands, including Zillow, Trulia, HotPads, StreetEasy, OutEast and Realestate.com. She was part of the founding team at Zillow in 2005, and as the company’s marketing leader, built the Zillow brand from a startup into a household name. Bohutinsky served as Chief Marketing Officer through the company’s 2011 IPO and 13 acquisitions, and in 2015 she became COO with the formation of the Zillow Group and its portfolio of brands. The Entrepreneurship Summit will also feature networking events, a student pitch competition, an alumni pitch session, ideation sessions, and opportunities to interview current students for internships or full-time positions. A tentative schedule is now available online. Check back throughout the summer for an updated schedule and full list of speakers. Questions regarding the entrepreneurship program? Contact Dr. Jeff Shay, Johnson Professor of Entrepreneurship and Leadership, at shayj@wlu.edu.